This image of a breast cancer tumor and its microenvironment was obtained from a live mouse model using multiphoton microscopy and endogenous fluorescence. That is, the image was obtained without any fluorophores, stains, or dyes, using only the metabolic co-factors of NADH and FAD, which are already inside of cells, along with second harmonic generation to see collagen. This technique has important clinical potential for patients who require label-free imaging, and may lead to more effective diagnoses and treatments. 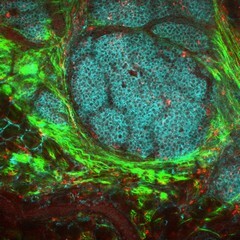 Tumor cells display in cyan, macrophages in red, collagen fibers in green. This image was originally submitted as part of the 2016 NCI Cancer Close Up project and selected for exhibit.